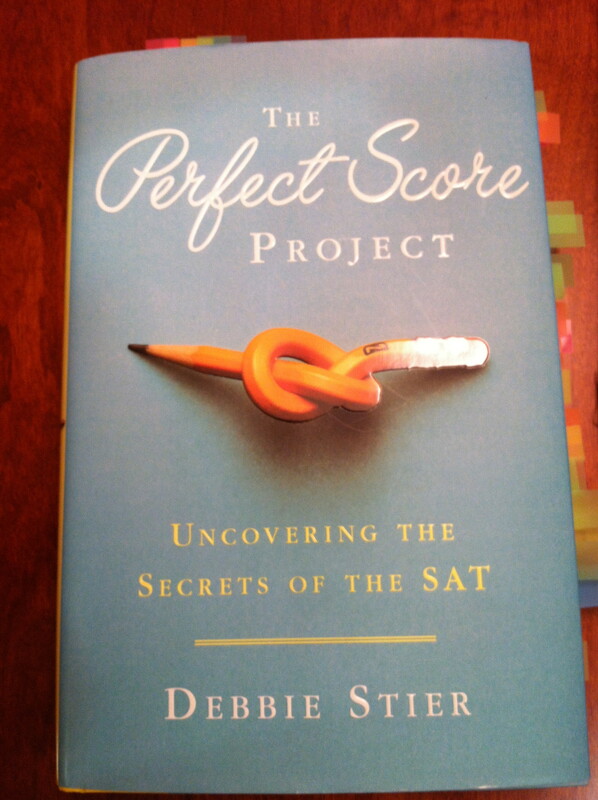 I just finished reading Debbie Stier’s book The Perfect Score Project. The book chronicles one mother’s attempt to get a perfect score on the SAT. Her plan: take the SAT all seven times it was offered in one year (2011), and sample a different test prep plan each month, all in the hopes of inspiring her son to study for the SAT (and hopefully get a perfect score). I found the book to be very entertaining, occasionally hilarious, and sprinkled with good SAT and parenting advice. I think it is a good, quick read for any parent with a son or daughter facing the SATs, although I wouldn’t recommend it for students unless they want to marvel at the strange obsessions of adults. 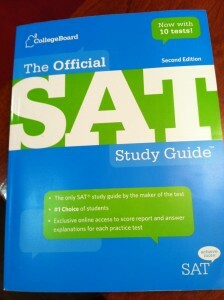 One of the things I like most about the book is that Stier does not claim to be the definitive expert on the SAT. She is relating her experiences of both preparing for and taking the SAT, and the reader clearly understands throughout that she is telling a story. While she does provide recommendations, she does so by telling what worked for her, and she gives the explanation of why she thinks it works. Stier leaves it to the reader to decide which nuggets of advice to use, which I appreciate. Another thing that I like is Stier’s passion for the SAT. She loves it – she loves taking it, studying for it, and discussing it. Reading this book almost made me want to take it again myself. Almost! It did bring home to me the point, however, that any good SAT tutor should regularly take the test herself, and that if you are considering hiring a tutor, that is a question you should ask. It’s not one of the five essential questions for tutors that she gives on p. 153, but I think it should be. What advice does Stier give? I think that her most important advice is to prepare using College Board materials, not practice tests or questions generated by other companies. She gives a detailed explanation of how the College Board creates its questions, and it is clear that their process cannot be replicated. Throughout her preparation, Stier could tell the difference between a true SAT question and one that was not created by the College Board. Most independent SAT tutors agree with this advice. What it means, however, is that students must be very thoughtful when using “the blue book.” (The College Board’s big book of SAT practice tests is commonly referred to as the blue book, for the obvious reason as you can see in the picture to the right.) If a student blows through the material in the blue book and still doesn’t feel prepared for the test, then it becomes much harder to find real College Board questions on which to practice. Another important piece of advice, often lost in all the noise about test prep classes, is that the test center itself matters. The size of the desks, whether the test is given in a large gym/cafeteria or smaller classrooms, familiarity with the location of the test center – all of these things matter. Stier advises that if you end up in a large gym (not preferred), then be sure to sit in the very front, to minimize the distraction of all the test takers around you, stretching, dropping their calculators, etc. She also says bring a snack (apples, water and a protein bar), don’t take the SAT with an unfamiliar calculator, and bring spare batteries! This is the kind of practical advice that you only get from someone who has actually taken the test. Stier also scatters tips throughout the book. She gives essay tips, math tips and vocabulary tips. All of them are interesting, but they also all require regular practice in order to be of use on test day. That is actually the bottom line of the book – test prep helps, but it only builds on the foundation of learning already established by the student. The stronger the foundation, the more easily test prep can be used to raise the student’s score. See my next blog post for more about The Perfect Score Project, although there will be spoilers in that one! 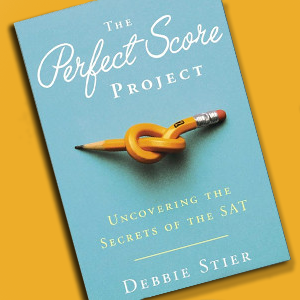 If you’re hungry for more SAT info, you can check out Debbie Stier on her website at www.perfectscoreproject.com.